Built by Iron Man for his best friend James Rhodes, the War Machine armor was meant to fill in whenever Iron Man wasn’t available. Every bit as powerful as Tony Stark’s original armor, and bristling with weapons, War Machine is built not just to stop evil, but to destroy it! Check out over 20 high res images and our quick thoughts after the break, courtesy of Dork Side Toys! Related Dork Side Toys links: Marvel Legends War Machine, All Marvel Legends, Newly Listed Hulkbuster Series Avengers Wave. 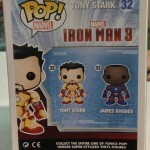 On the back of the upcoming San Diego Comic-Con Unmasked Tony Stark Iron Man Mark 42 Pop! Vinyl Figure, there is a preview for another unmasked character. The back of the packaging gives us a look at a James Rhodes Unmasked Iron Patriot Pop! Vinyl Figure. No details on where this figure will be available, but it will likely be an exclusive to some event or store. The pic comes courtesy of the Funko POP! Vinyl Figure Fan Page. Also, Toytastik has an exclusive bundle. The bundle contains two Unmasked Wolverine Pop! Vinyl Figures. A standard version and a glow-in-the-dark version are included. The set is priced at $39.99. It ships out in September.